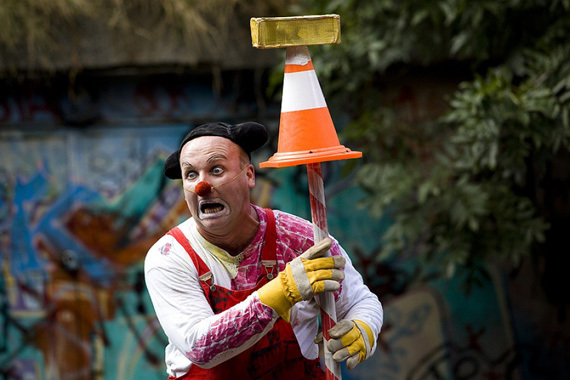 Every August a corner of Letna Park transforms into an Outdoor Contemporary Circus and Theatre festival. So for the next two weeks Prague residents are blessed with an array of affordable performances by local and international companies with a large proportion of these staged for children. Although Czech is the predominant language, many young children can enjoy the content regardless as many shows use non-verbal cues to enchant their young audience. 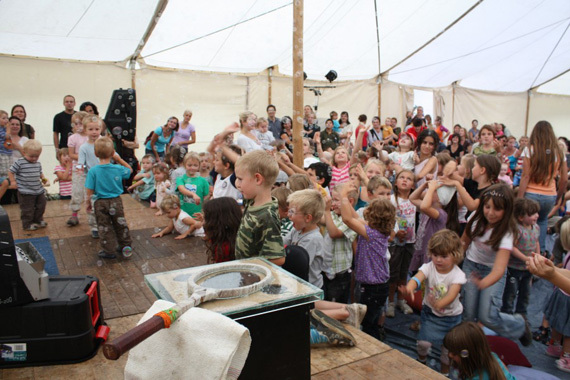 This year Letní Letná will present more than 90 shows, with up to five children’s shows per day, adult performances in the evenings, festival workshops for children, circus skills and art workshops, concerts, discussions, free performances – you name it, you’ll find it. 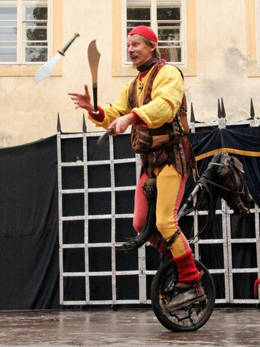 Friends have been attending this festival for years and have favourable reviews. I decided to check it out last year with Ari, who at the time was only 18 months old. The atmosphere was relaxed and the location was pretty easy to get to especially by tram. 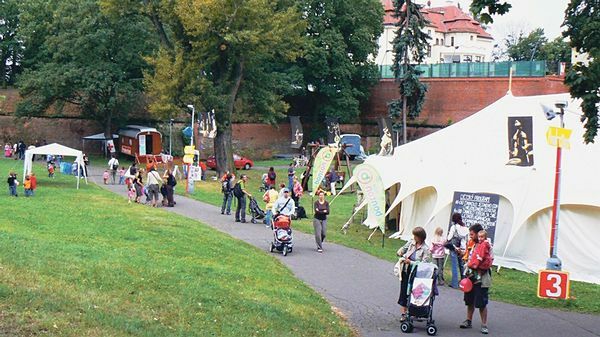 Tents were pitched above and within this sheltered valley, housing the venues, kiosks and even a kid’s art workshop. It’s worth noting that there is a bar and a tea house on-site providing not just food and drinks but evening entertainment - such as djs, live concerts and poetry readings. We turned up ahead of our show and managed to get tickets without any problem so it’s easy to be spontaneous when making last minute plans. Inside the moderately sized tent we found bench seating for our group and the kids piled right up front to catch all the action. 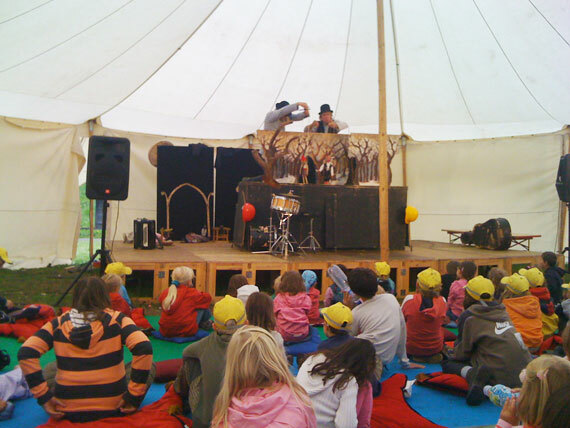 The show was staged by a fairly well-known puppet troupe and the kids were gripped by their performance, from memory it was a variation of The 3 Little Pigs. Afterwards, those who were up for it had a beer outside whilst the kids begged us for ice cream money, they then entertained themselves quite nicely by rolling down the valley hill. All in all, a very pleasant way to spend the day prior to school starting back up and not a bad view from there either! 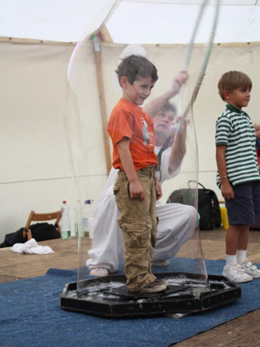 Those who do not have children or can organise baby sitting are also advised to try out one of the many modern circus troupes (in the style of Cirque du Soleil) as well as a variety of other big shows most often performed in the evenings. Here you will find the full program online for the festival. Note the British flag indicates performances suited to non-czech speakers and more importantly ‘pro deti’ in green indicates children’s shows. PERFORMANCES FOR KIDS – 70 CZK per child or purchase a Family packet - 4 tickets: 240 CZK (60 CZK/person)* Other performances on the Open Stage are free. *Please note that the box office cannot accept credit cards, only cash. Take a look at Letní Letná‘s comprehensive website in English, it contains all the information you need to pick the show that is right for you. You will also find info on the nightly music performances planned, a perfect spot for an evening out if the weather stays as balmy as it is right now! 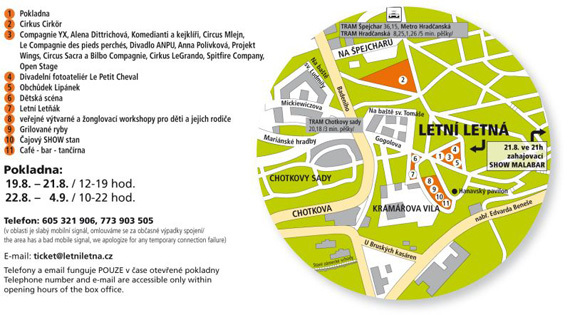 DIRECTIONS: By Tram: Take trams 15, 25 or 26 to tram stop Špejchar. By Bus: Take No. X1 (from Hradčanská Metro). By Metro: Green Line A to Hradčanská, then an 8 minute walk to the festival site.